What says “Summer Food” more than BBQ Ribs???? Most everyone loves them, but many people don’t know how to cook them. 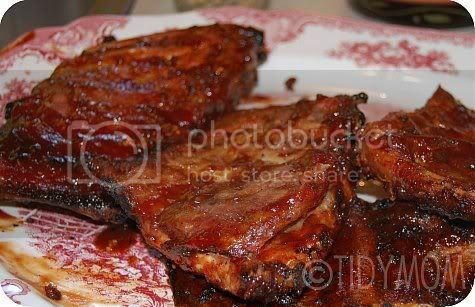 You can search the web, talk to friends or flip thru magazines and you will find oodles of different ways to cook ribs. Really, they’re VERY easy to fix, especially if you have the “secret tool”. Come a long, I will show you! St. Louis Style ribs are just spare ribs cut a little nicer – they have the top flap removed. St. Louis Style ribs (and spare ribs) are actually more meatier and have more flavor than baby back ribs. You will also need, Olive Oil, minced garlic, seasoned salt and pepper and your favorite BBQ Sauce – we use Sweet Baby Rays, and an aluminum foil pan. Cut your slabs of ribs in half (you will see why next). Then rub all sides with olive oil, then the garlic. Season with salt and pepper. You see the “secret tool” there? They’re Rib Racks! They make grilling your ribs a breeze!! Not only does it free up space on your grill to cook all the ribs you want, but keeps your ribs from burning. 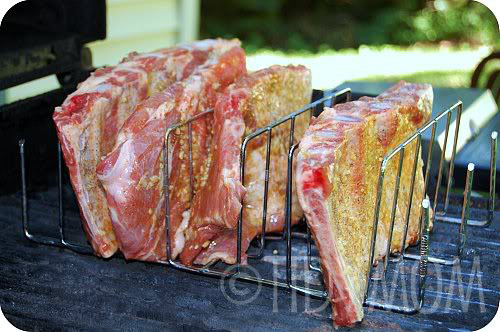 The rib racks we have easily fit 3 rib halves, but you can squeeze in 5 – so I got all 4 of mine on one rack. I place an aluminum foil pan filled with water or beer below the grates on the grill. We have a Weber gas grill, so I set the pan on top of the flavor savors. Cook on medium/low indirect heat for about one hour and 15 mins. CAREFULLY remove the ribs from the rack and place back on your platter and cover all sides with BBQ sauce then return to the rack. Continue to cook for another 30 mins, or until meat is about 1/4″ down from the end of the bone. 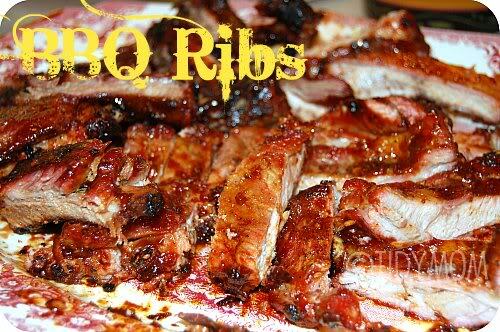 Remove ribs from the racks and place on platter for about 10-15 mins. to cool. Then cut rib portions and ENJOY!! 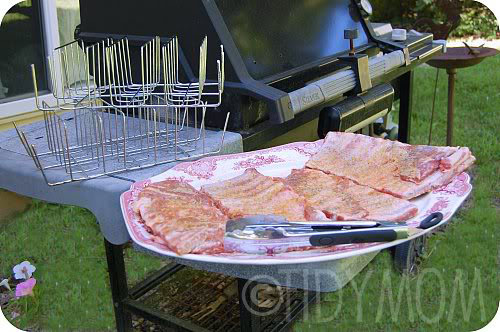 The rib racks clean up pretty easy, most can even be thrown in the dishwasher!! What I learned this week – Look inside the box! These look delicious! I am from Kansas City, so I am all about KC BBQ. St. Louis style is great, too! Thanks for sharing on our So Long Summer Blog BBQ. I am guessing that a pan of water/beer in a charcoal grill would work, too? Maybe placed along side the coals?